Earn up to 855 NewBonneville Bucks. 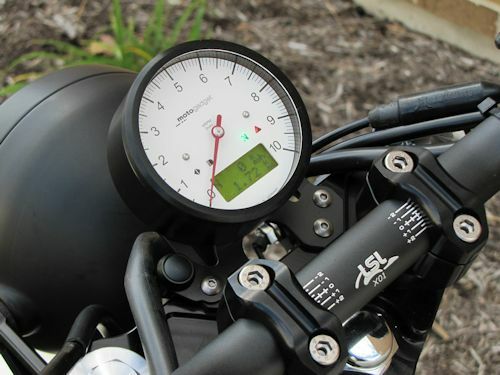 This kit combines parts from Motogadget and LSL to bring you a complete setup to replace the stock tachometer and speedometer with this ultra good looking and uber intuitive gauge. There are four main pieces to the kit. Two with brains and two with brawn. 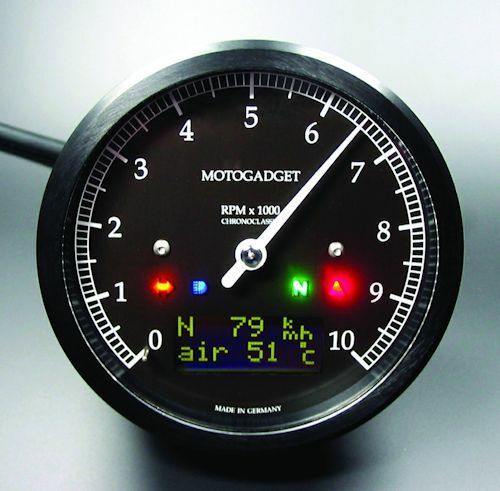 The brains of the operation are the MotoScope Classic Gauge and the m-TRI Control Unit. 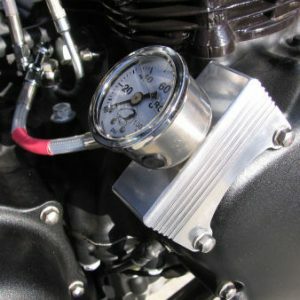 The utility parts are the LSL gauge bracket and Motogadget instrument cup. This gauge features a high-quality multifunctional instrument in a classic style housing with an analog engine speed indicator (stepper-motor driven) and a two-line display for all other functions. Temperature and pressure warning with High/Low thresholds. 4 indicator LEDs. Engine speed warning/gear shift light. Innovative background lighting (EL-foil). 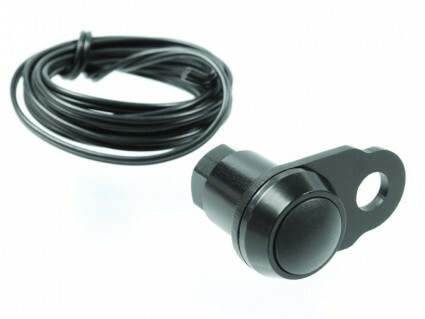 Original vehicle speedometer sensors can in most cases be used. Calibration of the speedometer is possible using an internal Teach Function. Installation diameter 3.15 inch (80 mm), total diameter 3.35 inch (85 mm), depth 1.34 inch (34 mm) without screwed cable gland. Weight 8.1 oz (230 gr) without cable. 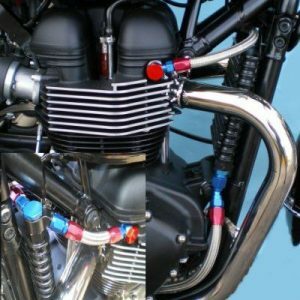 Functions: analog rev counter with scales of 0-8/0-10/0-14 krpm and a numerical display up to 20 krpm, engine speed warning, speedometer, gear position indicator, trip odometer, total odometer (adjustable), trip time, voltage indication, acceleration 0-100 km/h, various average and maximum values, 2 temperature indicators and 1 pressure indicator etc. Speedo sensor included. 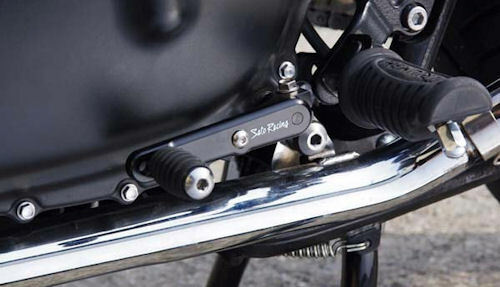 In the past, it was not possible to remove the original instruments on the Triumph Twin models (years 2010 and later) and Triple models (years 2006 and later). Except for the Breakout Box Triumph, exclusively designed for motoscope Pro, there was no way to operate a motogadget instrument. The solution, specially designed for use with Twin models, has arrived: the m-TRI, exclusively by motogadget. Another big advantage is the foolproof installation. The original connector is used, and the cables for the instrument and indicator lights are connected to the terminals of the m-TRI with color codes. No soldering or cable detection. No changing the wiring harness. No voiding the vehicle warranty. This simple installation is almost Plug and Play. It saves time …and money. Easy to follow installation instructions are included. 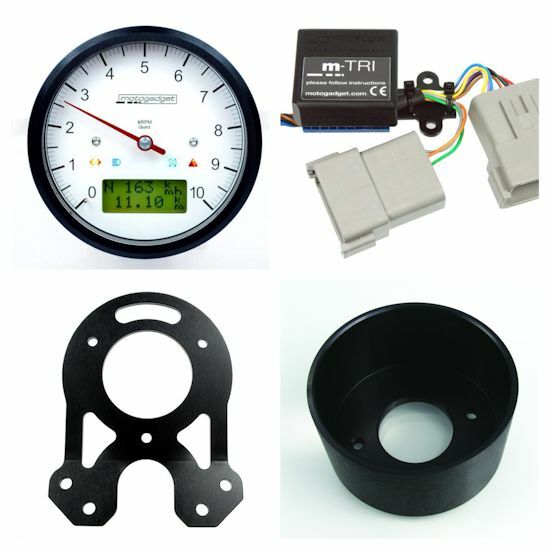 Contact us for custom options such as black face, speedometer instead of tachometer for the main gauge, etc. During checkout, please make sure the correct model and year are entered into the “Bike Year and Model” field. Please note that the model year is not necessarily identical to the year of manufacture! Identify the 11th digit from the left on the VIN number; this number/letter will give you the model year.